Downtown II is the downtown of today's office buildings. 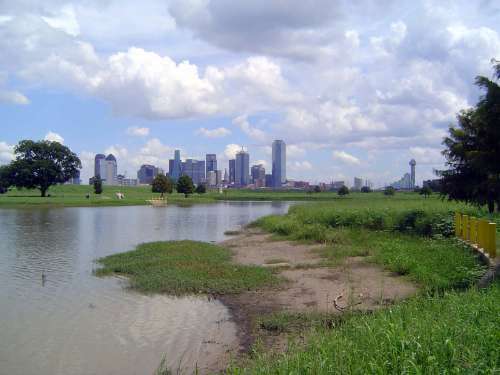 The downtown skyline from a pond in the floodplain of the Trinity. One of two confining dikes can be seen stretching behind the tree at the left. The view is toward the southeast. A closer view, still from within the floodplain. 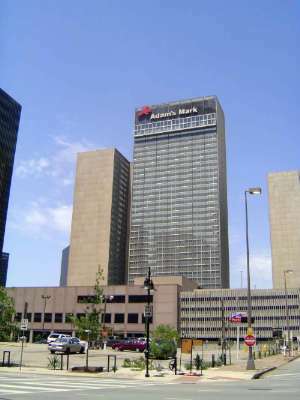 The tallest building is the Bank of America building, from 1985. 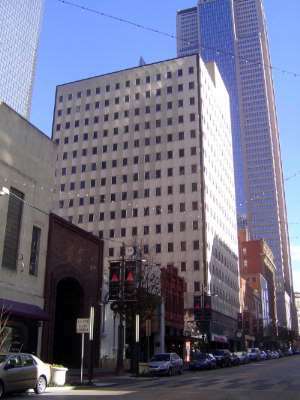 To its left, the square building with a steel tower is the Renaissance Tower of 1974. 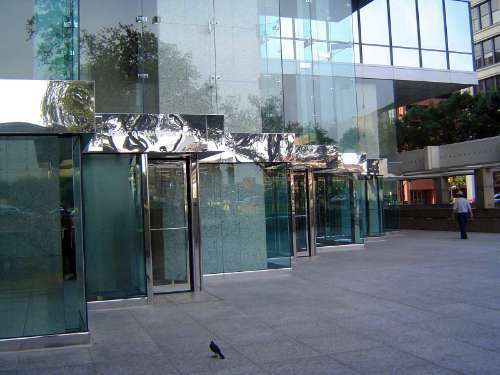 The glass-wrapped arrow is Fountain Place, from 1986. 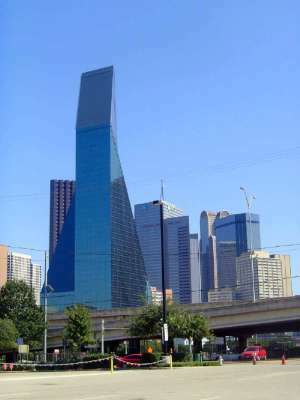 To its left is the pyramidal Trammell Crow Tower of 1985 and, behind it to the right, the keyhole-slotted JP Morgan Chase Tower of 1987. 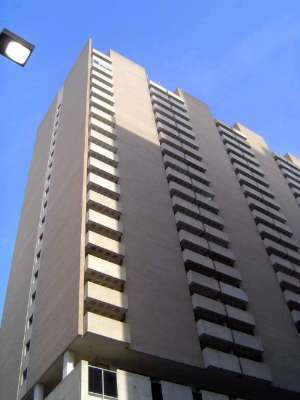 The skyline, in short, underwent massive revision in the early 1980s. Nothing over 300 feet has been built downtown since then. 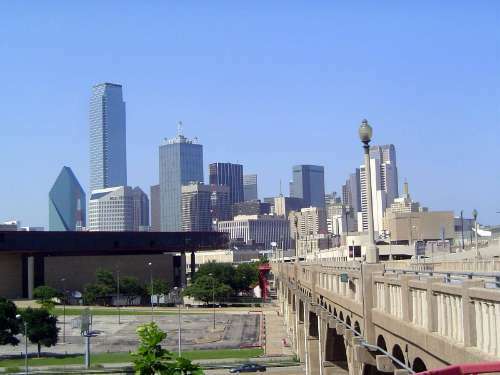 From the Commerce Street Viaduct, which crosses the river, the skyline is still dominated by the Bank of America, Renaissance, and JPMorgan towers. The names are less permanent than the buildings themselves: Bank of America was originally First Interstate Bank, the Renaissance was originally First International, and JPMorgan Chase was originally Bank One. The view from the historically important corner of Pacific Avenue and North Hawkins, where the first two railroads of Dallas crossed. The warehouse sits approximately on the site of the old station. 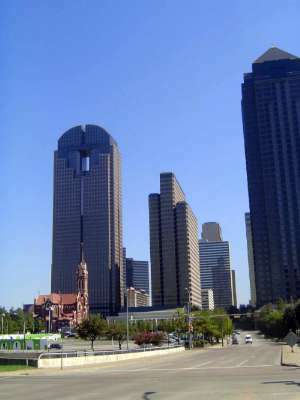 Comerica (originally Bank One) is the barrel-vaulted tower on the left; the pyramidal Trammell Crow is on the far right. Behind the warehouse is the Sheraton, which opened in 1959 as part of Southland Center. Southland was originally an insurance company, but it grew to include the ice company that had itself grown to include 7-Eleven. 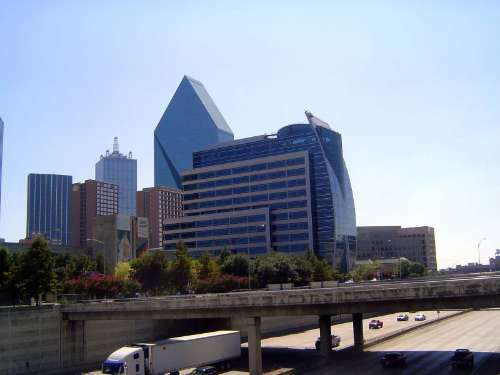 The hotel is the biggest in Dallas. 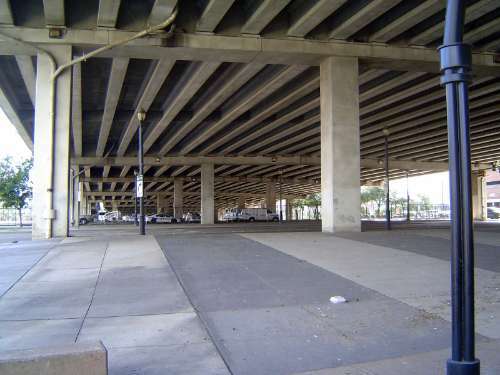 Like many American cities, Dallas has a downtown that's wrapped in freeways. They're supposed to improve access, of course, but they do an even better job of walling downtown off from the surrounding neighborhoods. 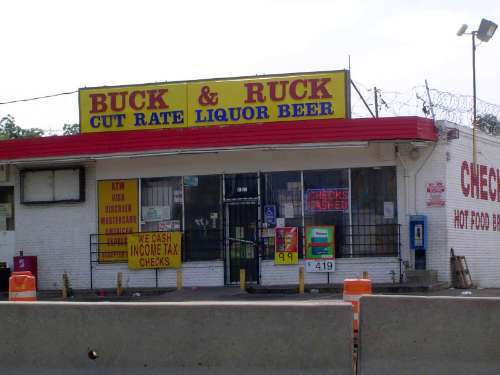 In some cases, that's their intention--to protect businessmen from mostly black neighborhoods. In the process, they make downtown an island. Downtown is to the right; Uptown is to the left. To its credit, the city has now built a 5-acre park that roofs this freeway and provides an escape path for pedestrians trapped downtown. 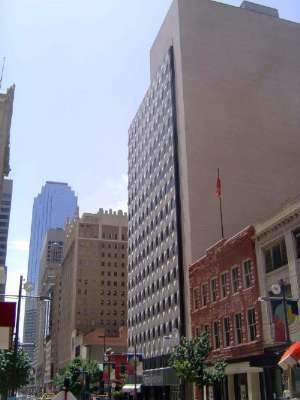 The city's first skyscraper, the Praetorian Building of 1910, hides under a skin applied in 1960. The Praetorian, here from another angle, has been empty since sometime in the late 1980s. Easy to overlook today, it must have once seemed huge in a city where most downtown buildings were like the Praetorian's neighbors seen here. Southland Center was 100 feet higher than anything else in the city when it was built in 1959. The architect was Welton Becket, a prolific firm in California. Since this picture was taken, the hotel has been reflagged a Sheraton, which is what it was when it opened fifty years ago. 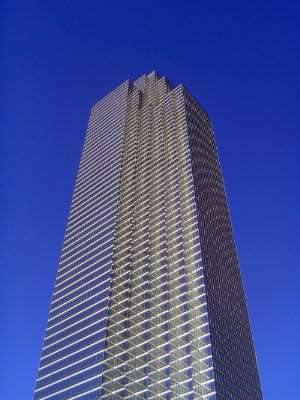 The Bank of America Tower. A twin tower was planned but never built. 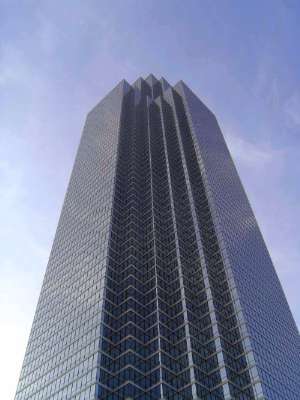 Fountain Place, designed by Pei Cobb Freed. 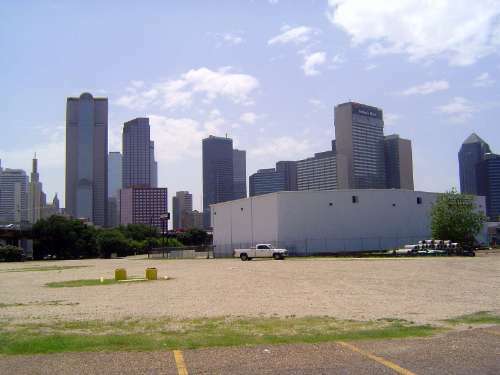 All three of these buildings--JPMorgan Chase from 1986, the San Jacinto Center from 1982, and the Trammell Crow Building from 1985--were built by the Trammell Crow firm. The central one is a copy of yet another Crow building, one in San Francisco. The church lost in the foreground was built as the Cathedral of the Sacred Heart and dedicated in 1902. In 1975 the nearby Our Lady of Guadalupe was closed and merged with the cathedral, which was renamed Cathedral Santuario de Guadalupe. The white building to its right is the Belo Mansion, shown in the previous group. 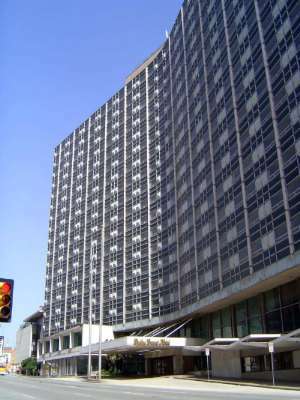 The former Grand Hotel, which opened as the Dallas Statler Hilton in 1956. 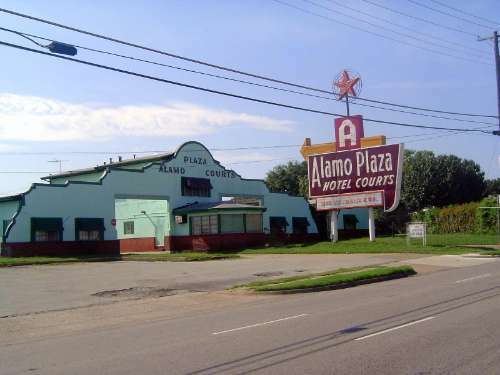 It closed in 2001 but in 2017 was getting ready to re-open as a mixed-use project. Its flat-slab concrete floors were innovative. Here it rises over the construction of an underground garage, which is to be roofed with a park. 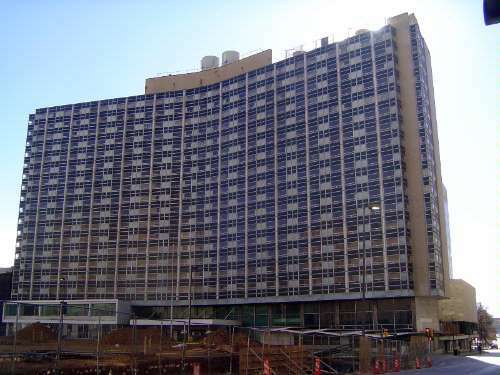 In 2015, a Texas-based suburban development company called the Centurion American Development Group announced its intention of spending $175 million converting the Hilton's top 11 floors to apartments and reopening the lower five as a Hilton hotel. 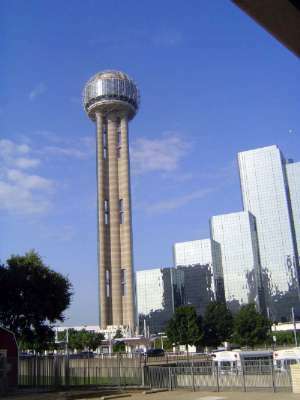 The Reunion Tower is part of the Hyatt Regency Hotel from 1978. 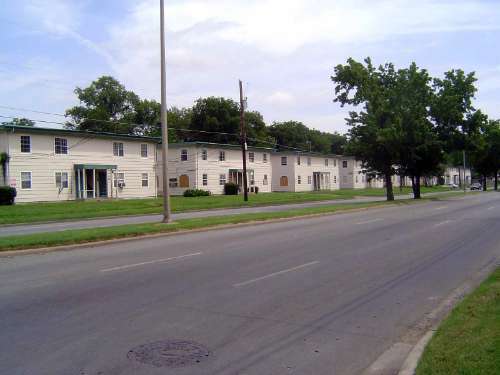 This was another Welton Becket project, 20 years after the Southland Center. The name Reunion comes from La Reunion Colony, a Fourier-style utopian venture in the 1850s. The last gasp of a residential downtown: the grim Manor House of 1966. No new residential construction would take place downtown for another 40 years. 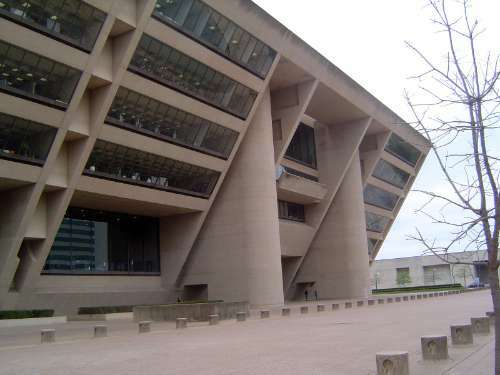 The intimidating City Hall, designed by no less than I.M. Pei and opened in 1978. 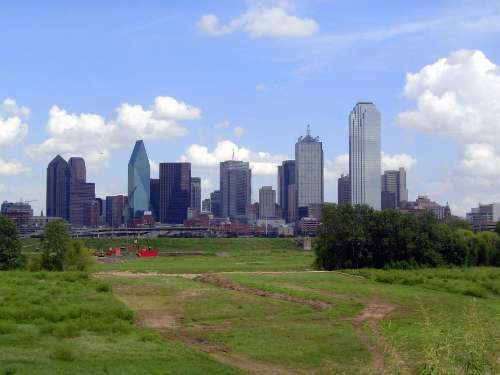 The periphery of downtown has suffered, with the exception of the prosperous side. 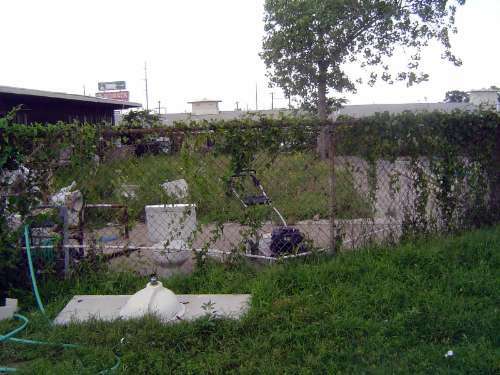 Here: a motel on U.S. 80 a mile west of downtown. 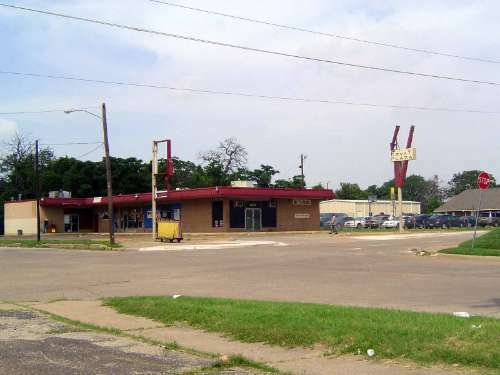 A strip mall on the south side of downtown, perhaps a 10 minute walk from Neiman-Marcus. 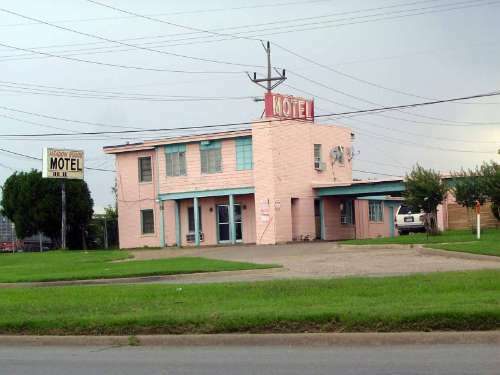 A motel on U.S. 77 north of downtown. The swimming pool has been filled in and is now overgrown. Meanwhile, the Trinity flows along. A hotly debated plan has the city building a new bypass highway at the edge of the floodplain. 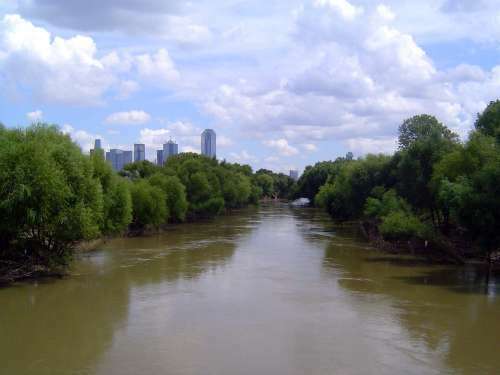 I-35 is too congested, the argument goes, and the new road won't disturb plans for developing a park along the river. Tell me another.